It’s fair to say that things are going fairly well over at Canon. This year the company celebrates 30 years of its ultra-successful EOS line-up, 14 consecutive years of holding the number one share in the interchangeable-lens market, a 72% share of the total DSLR market (Nov 2016), and welcomes news that a staggering one in three of all cameras sold now have a Canon badge on the front. The tech giant has marked the occasion with the announcement of two new upper entry-level DSLRs – the 77D and the 800D. While extremely similar internally, the external controls and menu systems are cleverly tailored to cater for different users. Let’s take a closer look at the less advanced option, the 800D. At the heart of the camera is the same 24.2MP sensor found in the enthusiast-level 80D, which means image quality is very impressive for a camera at this level. It also boasts the world’s fastest autofocus speed of 0.03sec in Live View, which is a first on APS-C cameras using phase-detect AF. Powering the 800D is the top-of-the-line Digic 7 processor, which is capable of handling 14x more info than the old Digic 6. This upgrade is responsible for an improved ISO performance, as well as the blisteringly-fast AF speeds. Canon’s Dual Pixel sensor-based autofocus introduces 45 cross-type points (up from 19) to its entry-level line-up. These are split into both phase and contrast detection and cover approximately 80% of the overall frame, perfect for achieving sharp images in an instant. Canon has yet to introduce 4K to its enthusiast camera range, and as such it is currently only available on the 5D MkIV, 1D X MkII and one of its Cinema video cameras. While 4K is fast becoming the norm on mirrorless cameras, it’s less common on DSLRs, so the omission is unlikely to phase its core audience. There is an included Full HD video mode, so you can still create some great clips alongside your photography. 4K is very reliant on having a fairly powerful computer setup though, so in reality Full HD is a smarter option for your average consumer. The 3in 1040k-dot vari-angle touchscreen is snappy and responsive, and Live View boasts vibrant colours, flawless interactivity and smooth and instant touch focusing. Being able to alter the angle of the screen opens up new composition possibilities and is great for those who don’t want to rely on the traditional viewfinder. As with its siblings, the 800D features the full complement of wireless tools – Wi-Fi, NFC and Bluetooth – including the ability to wake up your camera from sleep mode to ensure you get that must-have shot. The other brand-new inclusion is the interactive menu, aka the User Guide. Switch to certain settings (such as aperture-priority or shutter-priority) and you’ll get a brief visual explanation of the effect it will have on your image. This is great if you are new to photography and want to learn by doing. These aids can be turned off should you outgrow the feature. Sitting at the lower end of the spectrum, it’s no surprise that the 800D lacks the premium feel of more expensive models. The casing is plastic, which does the job with no frills and allows the weight to be kept down to a trim 532g. Buttons are placed well and the overall ergonomics are the obvious result of 30 years’ of fine-tuning. However, the four-point button layout instead of a rear dial does make this feel more entry-level. Each button is placed intuitively around the central menu button, though they do feel rather flimsy. They have obviously been designed to give you quick access to important features without the need to hunt through the menus, and in this sense they work brilliantly and really speed up operation. As expected from a camera with the heart of the 80D, the 800D performs superbly. The Live View is excellent, and image quality is generally very impressive, with colour and dynamic range displayed beautifully. The ergonomics allow for quick and intuitive use for all skill levels, with the pre-defined shortcuts feeling like common sense and bridging the gap between a compact layout and a DSLR nicely, perfect for demystifying settings for those starting out. The video mode, though lacking 4K, works well and provides great-looking results. The camera also has in-camera 5-axis digital image stabilisation, though this is only available in video mode and not for stills. For those not interested in video, stabilisation takes place in-lens – the EF-S 18-55mm kit lens has in-built IS capable of 4-stops of stabilisation. This performs well and, taking into consideration the lightness of the 800D, allows for solid handheld shooting in low light conditions. I was able to get sharp results while working handheld at 1/20sec, which would be problematic with a heavier setup. As you’d expect with such an illustrious sensor under the hood, noise handling is very capable and has come a long way in the last five years. Images are extremely clear at lower ISOs, with a tiny amount of noise creeping in at ISO 1600. At ISO 3200 the noise is more noticeable, though images are still useable even at ISO 6400. Beyond this, sharpness and details tend to diminish rapidly, but for this level of camera the ISO is still relatively impressive. The camera’s metering system is very accurate, providing near-perfect exposures every time in Evaluative mode, even facing into the sun. On the rare occasions where it does struggle, the +/-5 exposure compensation is on hand to rescue the shots. Autofocusing is as swift as promised, locking onto almost any subject in daylight with virtually no delay. Switching from the optical viewfinder to Live View gave me very few issues. The 0.03sec AF claim is accurate and the variety of modes is extensive. The only gripe is not being able to select focus points via the same controls you would when using the viewfinder (Live View disables this option, with everything taking place on-screen via the Q menu). Similarly, the drive modes (such as continuous burst and self-timer), white balance and picture style buttons are all disabled, becoming responsible for controlling the focus point. Although adding this functionality to the Q menu allows you the same level of useability, it is frustrating to have to switch your style of shooting. The vari-angle touchscreen is useful for composing at tricky angles, especially at ground-level. Pulling out the touchscreen and rotating skywards allowed me to get close to the ground, perfect for shooting in muddy fields to capture images that would otherwise require laying on the floor. Being an entry-level camera, the Canon 800D’s build quality is perfectly adequate, but lacks the premium feel of more advanced options. The 800D is a great camera for those starting out, boasting enthusiast-level image quality. It features lightning-fast AF, a responsive touchscreen, a brilliant 24.2MP sensor and a Digic 7 powered processor. But since the internal specs are identical to the slightly more robust and intuitive 77D (which is only £50 extra), you might feel this is a better value option. 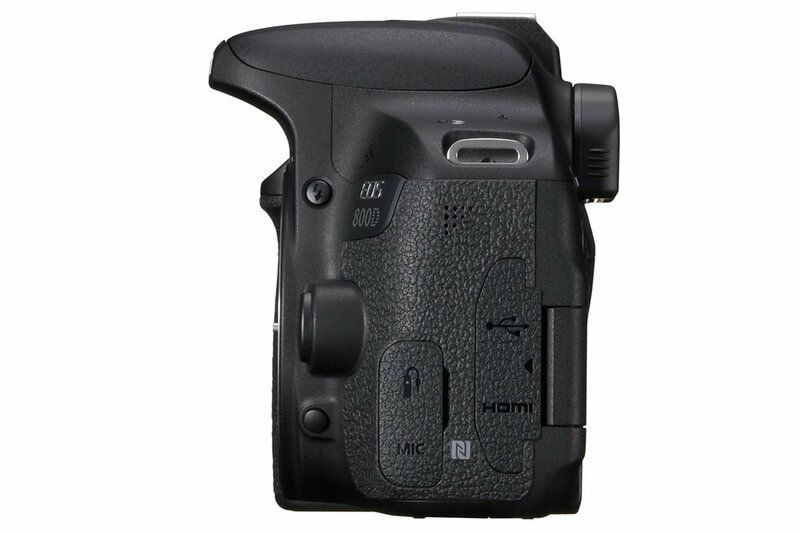 The 77D still offers the same 80D sensor, but comes with several additional features, such as a top-plate LCD, an AF back button and the rear-wheel that’s synonymous with Canon DSLRs, while only weighing 8g more. For beginners though, you can’t go wrong with the intuitive and quality 800D.